Three years on and Sweden's flagship SUV is as stunning as ever. We've made no secret that we love Volvo, especially its crossovers. We recently , saying they could “challenge the market leaders” and gave the all-new XC40 a glowing review during a . We’re not the only ones who are all-in on Volvo’s crossovers. The 2018 XC60 recently won , making it the first Volvo ever to capture the award. Volvo’s SUV range rightfully deserves all the praise it’s getting, and after a week with the 2018 XC90, this extends to its largest offering. The current-gen XC90 has remained mostly unchanged since it debuted in 2015. Automakers tend to operate on a five-year design cycle, with a significant update in between. Volvo has been a bit busy straightening out its lineup, which means the 2018 XC90 we lived with for a few days is more or less the same as the redesigned 2016 model that knocked our socks off all those years ago. In case you were wondering, that’s not a bad thing. The 2018 XC90 is available in four trim levels: Momentum, R-Design, Inscription and Excellence. Our loaner was a T6 AWD Inscription; all-wheel drive is standard on this trim level. The T6 designation refers to the power plant, which in this case is a turbocharged and supercharged 2.0-liter four-cylinder engine making 316 horsepower and 295 lb-ft of torque that’s mated to an eight-speed automatic. There’s no V6 or V8 on offer, but a more powerful hybrid engine is an option. The T8 Twin Engine ups the ante on power, producing a combined 400 horses and 472 lb-ft of torque. That said, it also raises the SUV’s base price from $59,450 to $70,050. Having spent a week behind the wheel of the XC90, we can confirm that the T6 provides just the right amount of grunt. The XC90 can be hustled from 0 to 60 mph in 6.1 seconds, which is quite impressive given its curb weight of 4,623 pounds. Power is readily available thanks to the combination of the turbocharger and supercharger, which makes passing situations a breeze. Comfort, Eco, Off Road, Dynamic and Individual are the drive modes on offer. Flipping to Dynamic mode and stepping on the gas is always fun, but the XC90 isn’t designed for pace-setting performance. The steering lacks feel and feedback and there’s noticeable body roll through bends. Doing your best Ken Block impersonation is also guaranteed to kill your gas mileage. The XC90 was close to its EPA estimated 20/27/23 mpg (city, highway, combined) when we cruised in Comfort mode. That figure fell sharply to 16.7 mpg during a longer drive split between Dynamic and Eco modes. 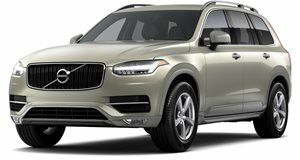 The bad news is that the 2018 XC90 is not a curve carver. The good news is that the XC90 doesn’t feel all that big to drive in close-quarter situations, like crowded parking lots or packed city streets. Regardless of where you’re driving, the crossover’s suspension system ensures a smooth ride. Our tester came equipped with the optional air suspension system, an $1,800 option. The suspension lowers and raises the ride height based on the selected drive mode and is able to soak up most bumps with ease. When we said the XC90 has remained mostly unchanged since the current generation debuted in 2015, we were only telling a partial truth. Pilot Assist, the name of the company’s semi-autonomous driving technology, has been given an update. The first version of the technology could not be used at speeds of over 30 mph and could only steer the SUV when it was behind another car. Pilot Assist II raised the speed limit to 80 mph and removes the need to track another vehicle for turning purposes. During our testing, Pilot Assist was able to competently keep the three-row crossover between the lane lines during long highway drives. Unlike other manufacturers, Volvo doesn’t require drivers to keep their hands on the wheel when Pilot Assist is active. A few touches of the wheel here and there is all the car needs to know you’re still alive. The system makes it very, very easy to zone out on longer drives. That said, it’s far from perfect. Braking during stop-and-go traffic can best be described as erratic and the system did make us break a sweat or two as it struggled to find the right line when the highway would curve. Your experience will vary based on the weather and road conditions. Both at night and during the day, Pilot Assist was able to keep the XC90 on the straight and narrow. That said, we were driving on highways outside of Chicago in clear conditions. The experience was different when we tested Pilot Assist in Austin, with the car struggling to stay between the lane lines. Despite its faults, Volvo’s Pilot Assist system is still one of the industry’s best, just so long as you don’t expect too much from it. The best part about turning on Pilot Assist is the ability to enjoy the Volvo’s luxurious cabin. Our tester came optioned with the aptly named “Luxury Package,” which adds a massaging function to the front seats and a heater to the second row. Another notable option was the premium Bowers and Wilkins sound system, a 19-speaker system (featuring a dash-mounted tweeter) that features a handful of sounds modes. We praised this sound system a few years back , so we won’t go into exhaustive detail here. Simply put: It’s awesome and worth the money. The XC90 that Volvo loaned us came loaded with $14,940 worth of options and had a sticker price just north of $74,000. While we appreciated each and every one — it’s nice to play pretend rich — the truth is that the T6 AWD Inscription isn’t exactly hurting for luxury. The trim level comes standard with features like ventilated and heated front Nappa leather seats, panoramic moonroof, walnut wood inlays, a 9-inch touchscreen infotainment center, Apple CarPlay and Android Auto, navigation and a Wi-Fi hotspot. Standard safety tech includes a blind spot information system (complete with rear cross-traffic alert, a collision avoidance system and lane-keep assist). The XC90’s cabin truly is one of the segment’s best. The leather seats are supple yet firm and the 9-inch touchscreen is a breeze to navigate, although it can be difficult to pick up at first. The second row of seats provides decent legroom, but full-grown adults would do well to avoid sitting in the ultra-cramped third row. With all the seats up, the XC90 offers 15.4 cubic feet of cargo space. That figure jumps to 41.8 cubic feet with the third row folded and maxes out at 85.7 cubic feet with the second row down. A hands-free liftgate is standard, and the optional air suspension includes a feature that lowers the tailgate for easier cargo loading. If there’s one big complaint to make about the interior, it’s that there’s no option for power folding second and third row seats. That’s the definition of a First World problem, but it’s still a bit of a glaring omission in this segment. In Volvo’s perfect world, buyers would cross shop the XC90 alongside the Mercedes-Benz GLE, BMW X5 and Audi Q7. We don’t live in that world just yet, but it’s possible we will sooner than later. If Volvo continues to build cars that are as good looking, luxurious and smartly priced as the 2018 XC90, buyers may find themselves coveting a new European badge.